A Richmond-based stage curtain maker has landed a project from one of the most famous venues in the country — the John F. Kennedy Center for the Performing Arts in Washington, D.C.
LuXout Stage Curtains is set to start in December on a more than $100,000 contract to produce 23 curtains, which will be up to 30 feet tall. They will be used in a $119.5 million expansion at the Kennedy Center, which is adding studios, classrooms, meeting rooms, a lecture hall and an event space. The project, which is under construction, is scheduled to be completed by the end of 2018. This is the second time LuXout has worked on a Kennedy Center project. In 2010, the company cleaned and repaired the 65-foot-­tall curtains in the center’s grand foyer. LuXout is part of The Specialty Group Ltd., a multimillion-dollar Richmond-based company owned by Tony and Deborah Lovette. Specialty Group also includes Specialty Drapery, which provides window covers. 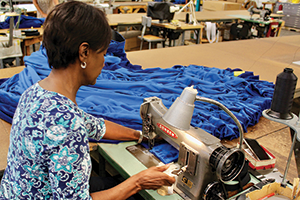 Specialty Group purchased LuXout in 2009, a move that served as a lifeline to the curtain company when many of its projects came to a halt during the Great Recession. LuXout mostly repairs and replaces curtains for auditoriums in public, K-12 schools. Since the recession, Specialty Group’s sales have increased an average of 22 percent a year. From 2016 to 2017, sales jumped more than 30 percent. Tony Lovette attributes that growth to more business from public schools and new construction projects, such as the Kennedy Center expansion. The company also is expanding. It has 31 employees and is looking to add six more. Specialty Group also recently created a division, LuXout Shades, which makes window shades for interior designers. LuXout Stage Curtains also recently opened an office in Dallas in addition to its locations in Richmond and Orlando, Fla. “The opportunity in [the Dallas] marketplace dwarfs everything we’ve ever done,” says Tony Lovette.